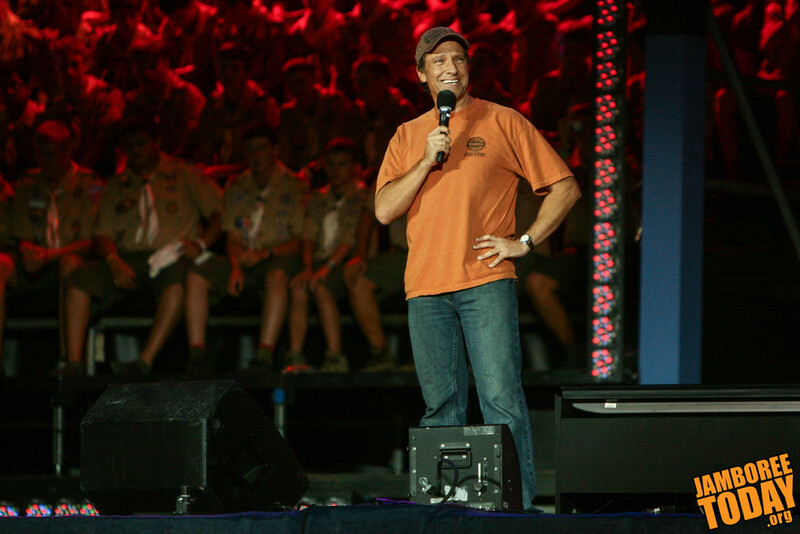 Rowe was addressing a crowd of over 70,000 Scouts and guests tonight at the 2010 National Scout Jamboree at Fort A.P. Hill in Virginia. The event celebrates Scouting’s one hundredth anniversary in America. He described a game that he was pulled into playing as being “designed by an idiot.” It involved swinging a bag full of wet rags around in a circle on a 12-foot rope. The Scouts standing in the circle try to jump as the bag passes. “And if you miss, the bag slams into your ankles and knocks you down,” Rowe said. “So I was in Boy Scouts for two minutes and I had a bloody nose,” he said. “Then the Scoutmaster made me get up and introduce myself,” Rowe said. He described his young self as shy, and that the thought of giving a five-minute speech about himself was terrifying. Yet he did it anyway, and bloody-nose and all, made it home that night. Rowe then became more serious and explained how these early Scouting experiences made him who he is. Rainy camp outs, merit badge presentations, hiking Philmont in 105-degree heat—they all make Scouts uncomfortable. Yet when the trial is over, they realize they have survived and triumphed. Suddenly the trial doesn’t seem so bad and the thought of taking on other challenges seems less scary. The TV star credited his entire career to his Scouting experience. To get on in life, you have to do things you don’t want to do, Rowe said. This is bravery. It is the tenth point of the Scout Law. Bravery can also be more broadly realized as a person’s willingness to undertake difficult life challenges. A student pursuing medical school, a couple adopting a disabled child, or a Scout embarking on his first steps on the Trail to Eagle could be examples of this commitment to bravery—“a commitment to being uncomfortable,” as Rowe might say. The Scouting experience, from sore feet during an inconceivably challenging Philmont trek to the heart-pounding nervousness that accompanies a Scouts’ first public speaking presentations, creates uncomfortable feelings. Feelings of uncertainty and self-doubt are integral to a Scout’s success. Once that connection is made, linking discomfort (taking a risk) to liking it (finding success), Scouts realize they can truly accomplish anything they put their mind to, from building a successful career to contributing to a strong family. That first step in any challenge is always the hardest, the most uncertain, the most uncomfortable. For one hundred years, the Boy Scouts of America has helped young men take those first steps, to find their bravery, and to make that bravery into success. Such success has not only benefited the millions of Scouts who have participated in the last one hundred years. It has also allowed the Boy Scouts of America to thrive into its second century of developing young men. “Happy birthday, everyone,” said Rowe. Here’s to many more.